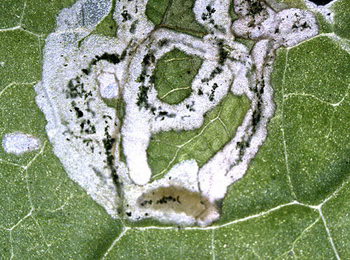 Leaf-miner: Rather small, untidy, full depth, often branched corridor, often close to the leaf margin. Sides irregularly eaten out. Frass in a greyish-green central line that is interrupted from time to time, sometimes partly in strings. In times of rain the frass may run out and appear greenish. Usually several mines in a leaf (Bladmineerders van Europa). Larva: The larvae of beetles have a head capsule and chewing mouthparts with opposable mandibles and lack abdominal legs (see examples). 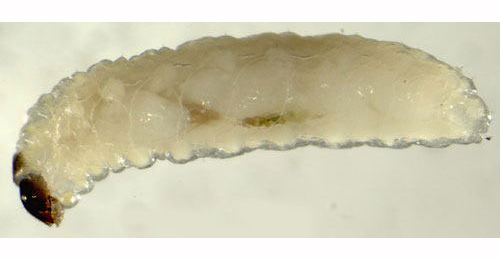 The larva is rather shapeless, with a well-sclerotised head and no feet. The body is whitish; head greyish brown with Y-shaped lighter marking. Pronotum with a pair of brownish shields. The mandibles have two teeth (Bladmineerders van Europa). Pupa: The pupae of beetles have visible head appendages, wings and legs which lie in sheaths (see examples). Ceutorhynchus insularis is a red data book species, which is unique to St Kilda within the British Isles. Prior to its rediscovery in 2004, the only previously published finding was from 1931. The food plant is common scurvy-grass (Cochlearia officinalis), the only wild crucifer recorded on St Kilda. A population regarded as a different variety of the same species occurs on islands off the South coast of Iceland. C. insularis is related to the common cabbage leaf weevil, C.minutus (= contractus), which is found on mainland Britain and in Europe. It is similar to a variety of C.minutus, which is found on Lundy Island in the Bristol Channel. (British leafminers). Alyssum saxatile is treated as Aurinia saxatile (Golden Alison) and Arabis arenosa is treated as Arabidopsis arenosa (Sand Rock-cress); Arabis glabra is treated as Turritis glabra (Tower Mustard) and Thlaspi perfoliatum is treated as Microthlaspi perfoliatum (Perfoliate Penny-cress) by Stace (2010). The Checklist of Beetles of the British Isles (2008 ediiton) includes Ceutorhynchus minutus (Reich, 1797) non (Drury, 1773) as a junior synonym of Ceutorhynchus contractus (Marsham, 1802). Time of year - larvae: June (British leafminers). Distribution in Great Britain and Ireland: Anglesey, Bedfordshire, Breconshire, Caernarvonshire, Cambridgeshire, Cardiganshire, Carmarthenshire, Cumberland, Denbighshire, Dorset, Dumfriesshire, East Gloucestershire, East Kent, East Norfolk, East Ross, East Suffolk, East Sussex, Glamorgan, Huntingdonshire, Isle of Man, Leicestershire, Mid-west Yorkshire, Monmouthshire, North Essex, North Lincolnshire, North Wiltshire, Northamptonshire, Pembrokeshire, Radnorshire, Shropshire, South Devon, South Essex, South Hampshire, South Lincolnshire, Stafford, Surrey, Warwickshire, West Cornwall, West Gloucestershire, West Kent, West Norfolk, West Suffolk, Westmorland and Worcestershire (NBN Atlas). Also recorded in the Republic of Ireland and Northern Ireland. (Alonso-Zarazaga in Fauna Europaea). Distribution elsewhere: Widespread in continental Europe including Austria, Belarus, Belgium, Bulgaria, Corsica, Crete, Croatia, Czech Republic, Danish mainland, Estonia, European Turkey, Finland, French mainland, Germany, Greek mainland, Hungary, Italian mainland, Latvia, Lithuania, Macedonia, Moldova, North Aegean Is., Norwegian mainland, Poland, Portuguese mainland, Romania, Russia - Central, East, North, Northwest and South, San Marino, Sardinia, Sicily, Slovakia, Slovenia, Spanish mainland, Sweden, Switzerland, The Netherlands, Ukraine and Yugoslavia. Also recorded from the East Palaearctic, Near East and North Africa (Alonso-Zarazaga in Fauna Europaea).